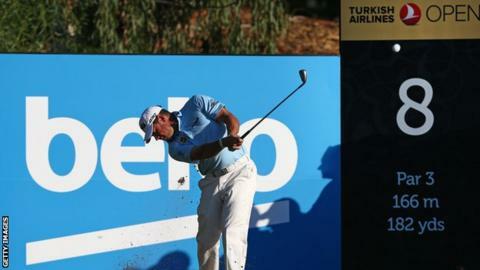 Lee Westwood made a strong start at the Turkish Airlines Open by carding an eight-under-par 64 to sit three shots off the lead after the first round. England's former world number one, 42, did not drop a shot as he recorded eight birdies, including four in a row from the 14th. Westwood trails leader Jaco van Zyl by three shots after the South African shot a superb 11-under-par 61. World number three Rory McIlroy is in contention on five under after a 67. The Northern Ireland player is looking for his first tournament win in five months after an injury-affected season. Starting on the 10th tee, he hit only one birdie on his outward nine but improved coming home with four birdies to tie for fourth place. This season's European Tour has four events remaining and McIlroy currently has a 271,214-point lead over Danny Willett in the Race to Dubai. England's Chris Wood is alone in third, two shots behind Westwood, following a round of 66 which included an eagle on the par-five fourth.